2014 - "Operation Hickory Smoke"
I'm a little late in getting this post written. But if you've read Grill & Barrel before, you know that each year we cook for some of our service men & women at Scott Air Force Base during an annual exercise. This year was no different. Well, maybe it was a little different. This event seems to get just a little bit bigger every eyar. 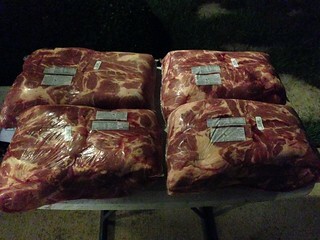 The first year, we only cooked 2 pork butts. This year, we cooked a whole case. See what I mean? Not that I'm complaining. I consider it an honor to cook for these folks and I'm glad that they enjoy the food (by all accounts). Here's looking forward to the 2015 version of Operation Hickory Smoke. For the past few years, I've cooked on a variety of pits at home. Each time, I've moved the pit from the garage to the edge of the driveway or onto the lawn. 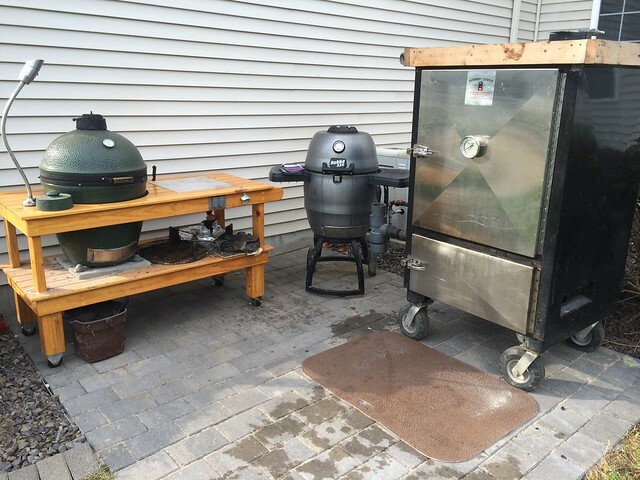 The benefit is that my BBQ Pits (I have more than one, doesn't everybody?) are stored indoors. The downside, my cars are not. So, I've decided that I'd like to get my cars in the garage. But, I didn't really have a great place to keep the BBQ gear and I wasn't sure about storing my gear outdoors. Recently, I took the first step in solving this problem and laid pavers behind the garage. So far, I couldn't be happier with the result. I've got 2 of 3 cars in the gargage and a dedicated space for cooking. I've ordered a cover for my Big Green Egg and table and I'm about to order one for my Backwoods cooker. Some time in the future, I could see a cover on this space. But that's a blog post for another day and at a time when the finances could support something more. If you find yourself within a reasonable drive of Danville, KY this weekend, you definitely need to stop by the Kentucky State BBQ Festival. If you've ever attended a BBQ competition, you know that it's a little disappointing not to be able to sample the best BBQ at the event. Well this festival changes that. Here, some of the top pitmasters in the country will be selling their BBQ. This year, the event starts on Friday. Here is the schedule for the weekend. Get out there and have some fun in Danville!